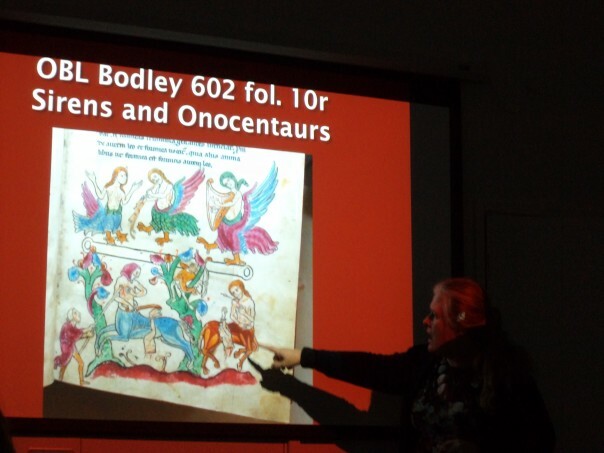 In many ways, both events I’m talking about this week can be seen as a legacy of the Medieval Canterbury Weekend. The first took place in St Martin’s Priory, the university’s very splendid building behind St Martin’s church that used to be a gentry-style residence. Its gardens are beautiful, hidden gems, but on this occasion people gathered in the Rose Room. The idea behind the meeting was to bring together representatives of the iconic medieval buildings that had featured during the Weekend so that the Dean of the Faculty of Arts and Humanities, Keith McLay, could meet them and thank them for their participation. Each of the buildings had already received a donation from the surplus made at the Weekend, and it was lovely that representatives from two of the buildings – St John’s Hospital and St Mildred’s church – could attend. The other two buildings were the Westgate Towers and the Poor Priests’ Hospital, which today is the city’s Heritage Museum. Having only met Sharon Keenor, the bursar from St John’s and St Nicholas’ hospitals once before, it was very pleasant to meet her again and there was a very interesting conversation around the coffee table about the value of closer ties among the city’s institutions. Accompanying her was Douglas Longstaff, one of the indwellers at St John’s who is the hospital’s own official guide when there are visitors to the Northgate hospital. 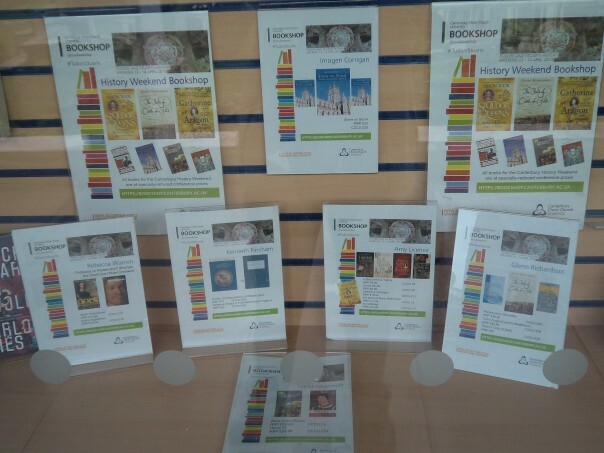 Having taken various groups around the hospital, as part of the Medieval Canterbury Weekend, as one of the Canterbury Festival Walks and my students when they have been studying medieval urban society, I have known Douglas for several years. Consequently it was lovely to see him on this occasion, and I’ll be seeing him again soon because the Canterbury Festival walks on behalf of Canterbury Archaeological Trust are only a couple of weeks away. The representative from St Mildred’s church was Margaret Northey, one of the two churchwardens, and we had met before when she had been on duty at the church and I had been with Louise Wilkinson and other people from Canterbury Christ Church at Canterbury Castle back in July for the Canterbury Medieval Festival. This event is due to take place again in early July 2017 and next year it will be over two days rather than just the Saturday. Louise was also at St Martin’s Priory last Monday and it was great to see the spirit of co-operation between the different Canterbury institutions. Also present was David Grummitt, the Head of the School of Humanities and another medievalist. Although David’s specialism is right at the end of the Middle Ages, he will be speaking on Tudor Calais at the Tudors and Stuarts History Weekend on the weekend of 31st March-2 April 2017. The second legacy event took place on Wednesday evening as part of the 5th Nightingale Lecture, a joint event organised by the Centre and the Agricultural Museum, Brook. Many of you will know of this Lecture from earlier blogs and hopefully from publicity sent out by the Arts and Culture representatives based in Augustine House. Before Professor John Martin’s lecture, the Dean congratulated two of the Ian Coulson Memorial Postgraduate Prize winners: Joseph O’Riordan and Jacie-Ann Ryan (Hannah Marsh, one of the other three prize winners had had to leave early). Joseph is about to start a Research Masters on the impact of the Reformation on the people of Canterbury and Jacie-Ann is starting a doctorate on food history in Kent, concentrating on the rural experience in Kent during the Second World War. 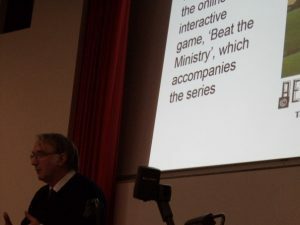 Such Kentish topics would have delighted Ian Coulson and Jacie-Ann’s topic is especially appropriate considering the subject of Professor Martin’s lecture. 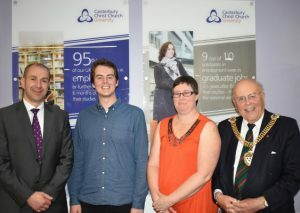 Also present for the prize giving and lecture were members of Ian’s family: Elizabeth and their son Jack, the Lord Mayor and Mayoress of Canterbury, several trustees from the Agricultural Museum, staff and students from Canterbury Christ Church, and members of the public, including some from the University of Kent. This audience of over sixty people then heard from John Nightingale, after whose father the Lecture is named, who explained a little bit about Michael Nightingale’s involvement in the establishing of the Agricultural Museum in its splendid late-14th-century barn. As one if not the driving force in the Museum’s creation through his long association with Wye College, it is excellent that this series of lectures has another academic ‘home’, the first lecture having been held at Wye College before its closure. Furthermore, having heard Christ Church’s own John Bulaitis give the Nightingale Lecture last year on the early 1930s ‘Tithe Wars’ in Kent, it was equally appropriate that this year John Martin explored the farming industry during the Second World War. 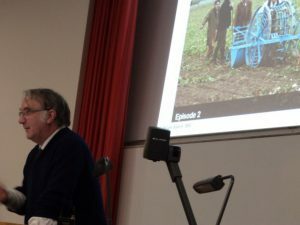 Using the BBC’s Wartime Farm programmes, for which he was the Series Consultant, Professor Martin took his audience through the various changes that took place in British agriculture during the war years, and, in particular, the move to much greater official involvement in farming practices. The ploughing up of a vast acreage of grassland is generally well known, but John explored this and its implications in more detail, as well as highlighting the official line on the growing and consuming of potatoes. He also mentioned ‘Dr Carrot’, whose advice on the benefits of consuming large quantities were not only followed by those in this country, including the night-time bombing pilots, but their German counterparts for the same reason – vitamin A and ‘the ability to see better in the dark’. As a result of such well-chosen examples, John gave his audience a number of thoughtful insights into why British agriculture was in many ways a success, but that this does need a degree of re-assessment because the propaganda of the war years crept into the post-war historiography, and beyond. The numerous questions that followed was testimony to people’s interest in the topic and several were able to draw on their or their parents’ experiences when asking John about matters from blocks of Icelandic cod to the production and consumption of beer, or alcohol more generally – back to the potatoes. At the conclusion of a fascinating evening, George Jessel the Chairman of the Trustees thanked the speaker. He similarly drew on his own more recent farming experience to reinforce just how significant the WWII had been in terms of the growth of officialdom and the industrialisation of agriculture, whether this is the daily capability of combine harvesters or the frequency of visits from the Ministry. So ended a couple of very enjoyable and interesting events that demonstrate the Centre’s involvement in the wider community – hopefully of great benefit to all.